Fabulous Flavor! Not! 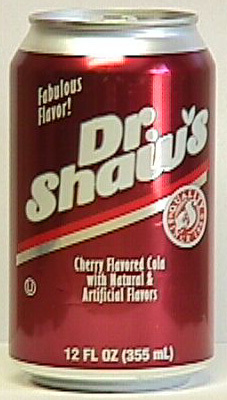 Dr. Shaw's does not tast much like Dr Pepper, and I'm not sure Shaw's tried to make it taste like Dr Pepper. It says right on the can "Cherry Flavored Cola" and that's what it tastes like. Cherry and corn syrup. I give it a 6. The ingredients are almost the same. However, there is no chance of sugar in Dr. Shaw's (there is in Dr Pepper). "Natural and artificial flavors" and "phosphoric acid" change places, meaning shaws has more acid than flavor. And for good measure, lactic acid is added on at the end.